Following a nine-month investigation and a multi-day trial, a Jefferson County jury has convicted Sherman Bell on one felony count of possessing and training dogs for dogfighting. Ohio law allows local humane societies to bring criminal charges directly against animal abusers, but this was the first time Ohio’s special private prosecution statute has been applied to dogfighting activities. In this case it was the Jefferson County Humane Society (JCHS) that brought the case. 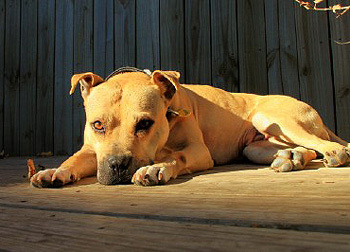 In 2010, local authorities raided Bell’s property, assisted by the JCHS and the Animal Rescue Team of the Humane Society of the United States (HSUS). They found dogfighting paraphernalia and seized 200 dogs along with 300 other animals including reptiles, chickens, roosters, boars and a variety of exotic birds in terrible condition. “This case should serve as a warning to others involved in this blood sport that their actions will not be tolerated,” said Chris Schindler, manager of animal fighting law enforcement for the HSUS. The rescue group Hello Bully helped the animals, and more than 150 dogs were placed with rescue groups and shelters across the country in several states including Ohio, Pennsylvania, New Jersey, Maine and California. According to HSUS estimates, 40,000 people follow organized dogfighting circuits across the U.S. while an additional 100,000 meet on neighborhood streets, alleys and hideaways.